If your BlackBerry Messenger Contact list seems to be growing out of control, or you just want to keep things a bit more organized, you can create contact categories to help you out. This is a simple feature that just requires a few menu clicks to get up and running. You can use contact categories to organize your contacts by family members, work contacts, friends or whatever suits your fancy. 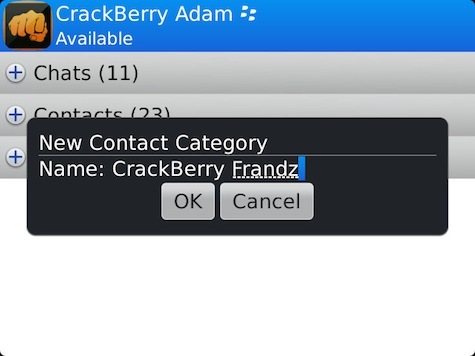 Keep reading to find out how to create your own contact categories in BlackBerry Messenger. You're free to create as many categories as you'd like and can move contacts between them as you see fit. To remove a category, just move the contacts to another category (highlight the category and choose Move Contacts to New Category) then press the Menu key and choose Delete Category.